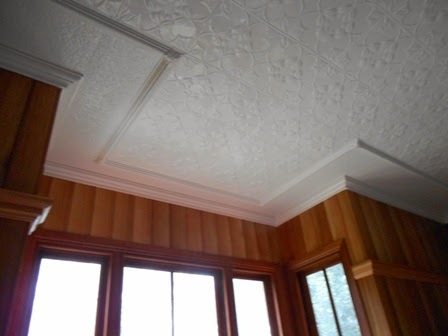 Our first project for the year has been installing pressed metal ceilings in three rooms of the house. 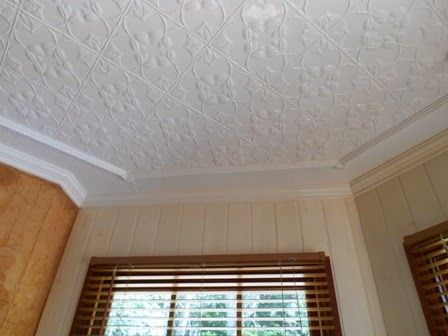 We sourced the pressed metal panels from Heritage Ceilings who have a tremendous range of traditional as well as more modern styles. 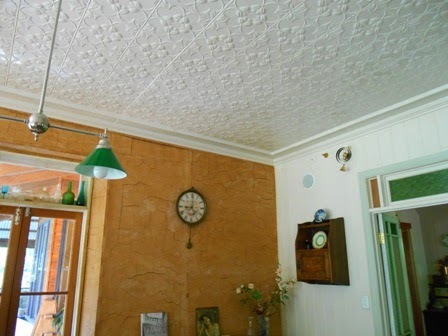 We'd had a quote of $11000 to install the ceilings, so decided instead to do it ourselves. The first job was to paint all 60 panels, plus cable moulding and corner rosettes, with three coats of paint, finishing with a gloss enamel. 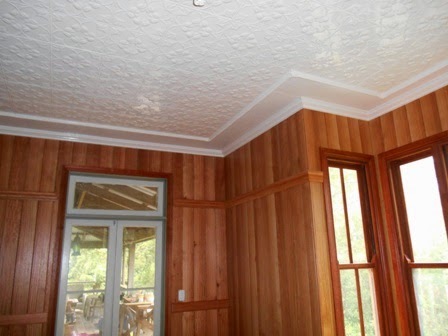 If you have to paint ceilings, it is certainly way easier when you can do it on the ground before they go up! Installation started with the downstairs 'powder room' as it was the simplest - all one style of panel with no border. Next was the dining room. This presented some challenges with angles around the bay window, and the additional features of cable moulding and border panels. 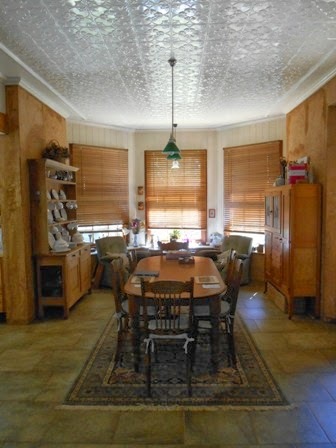 The final room was the yet-to-be-completed Macadamia Suite, the B&B suite at the end of the house. 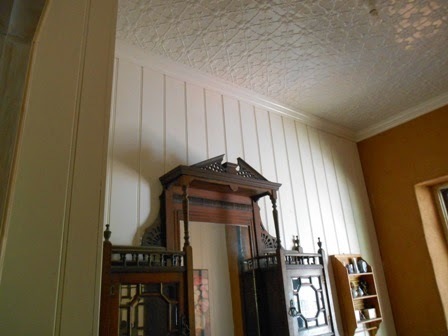 All rooms were finished with timber cornice. It pays to spend time filling nail holes and joins then painting them - tedious, but it results in a much more professional finish. 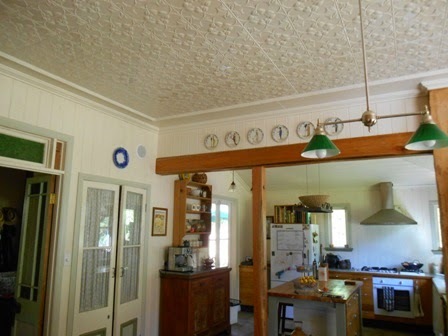 In all, putting up pressed metal ceilings is not particularly difficult. It requires two people to hold the panels up, and pre-drilling the nail holes helps. Our main concern was that the panels should be well aligned - like tiling, it would look awful if the lines were wobbly. But the panels have ridges on the edge, which allow for a sort of automatic alignment, so it wasn't as difficult as expected. It took us about eleven days to put up the three rooms. 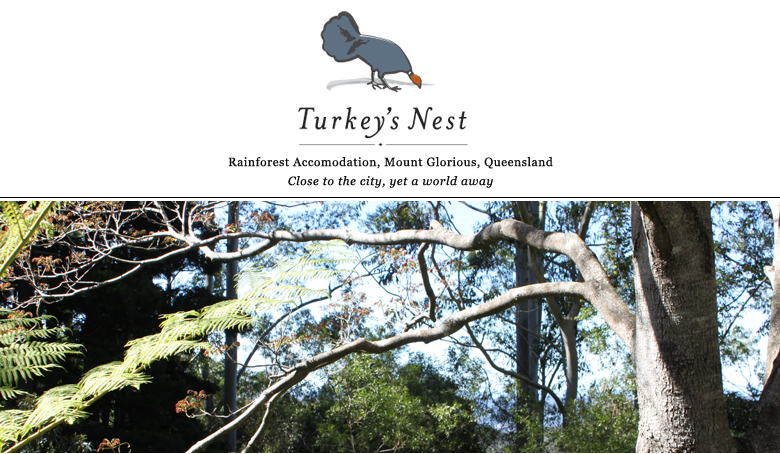 Given the installation quote we had, that equates to $1000 per day for our work. Better that we usually get!